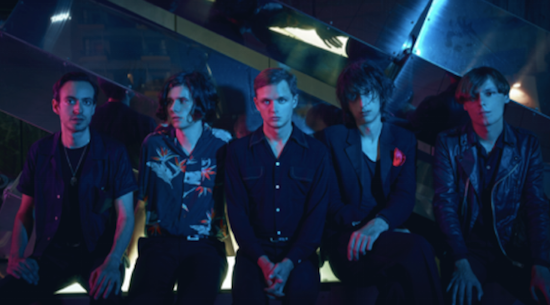 The Horrors have released a new two-track single, which you can listen to below. The tracks, titled 'Fire Escape' and 'Water Drop', came from the band's recording sessions for last year's album V.
"In typical Horrors fashion, we initially had the two tracks as one piece of music," the band explain. "First starting off with some synth loops our producer Paul put down, it evolved into this John Bonham-esque drum led track - 'Fire Escape' - which halfway through shifted gear entirely into what felt like Eno crossed with heavy Cluster/Harmonia on 'Water Drop'. "This change felt completely natural to us, with 'Water Drop' feeling like the perfect release to the intense onslaught of 'Fire Escape'. The dripping synth melody is the anchor in both tracks, gelling together two very different scenes into one. Unfortunately, the tracks didn't feel like they had a place on V but we still felt like we wanted to share them anyway as a little artefact from those sessions. A deeper cut for our fans." The single is out now and comes ahead of an extensive run of summer festival dates. You can check their tour dates here.